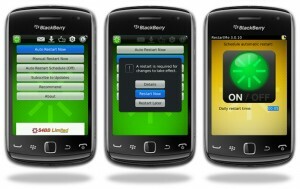 Today we’ve released Restart Me 3 for BlackBerry® Smartphones! This handy application allows you to reset your phone with a single click! No more battery pulls or difficult key combinations. The all new version is available for free at BlackBerry App World™. Daily Restart Schedule*: e.g. wake up with a freshly rebooted smartphone every morning at 7:00 a.m.
For more information about Restart Me, click here.